^The chests only exist in 1.0. In 2.0 and 3.0 you can buy the toys unlocked by characters in the toy store. -using sparks in the toystore. If memory serves right Rapunzel's tower should be among the buildings, were you also get the epcot center or matterhorn. Either unlocked or in the toystore section for purchase. Added the Mad Hatter, maybe the last figure ever. Strange, since I started the whole thing with Jack Sparrow. 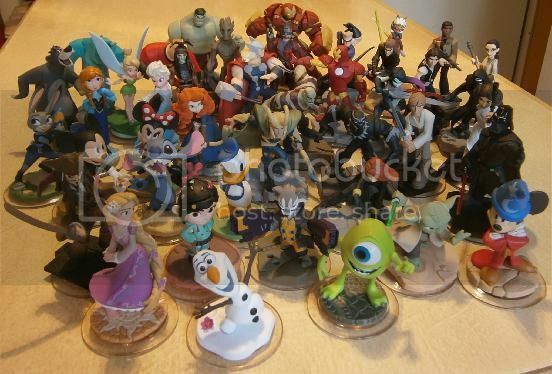 Well, as the prices drop I got some more: Maleficent, Nick Fury, Yondu, Battlegrounds Playset and Nemo. Still picking up bits and pieces. Got Inside out and Finding Dory Sets the other day, today I got crystal Jack Sparrow.